In the flesh, Prince is a lot funnier than his reputation might suggest. He kick-starts his show at the O2 arena – the new incarnation of the Millennium Dome – with ‘1999’ as if reminding everyone of the venues traumatic birth. His eighties-MTV-existentialism might have been an epitaph for the lacklustre state-sponsored millennium show: two thousand zero zero party over, Oops out of time. 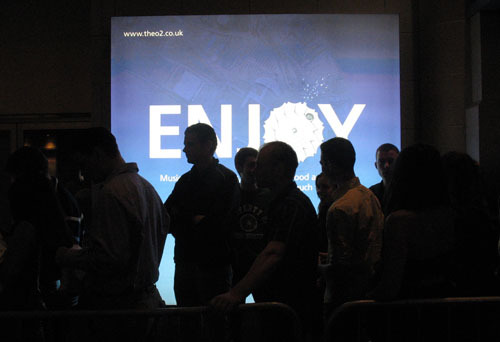 In the intervening years, the Dome has been cleared of its well-meaning, stilted, clunky sponsored edutainment and been redeveloped by the Anschutz Entertainment Group as the O2. As far as phase one goes, that means a 23,000 capacity indoor arena, a music club, an exhibition space and what’s called an Entertainment Avenue featuring an 11 screen cinema, bars, restaurants, a temporary beach, various blow up or tented in objects. (But no super casino). There is more entertainment to come with phase two. All of this shelters like a hermit crab under the Domes shell which still provides the iconic image of the venue. That’s already a lot of stuff – a whole entertainment district – but inside, I’m finding it hard to see any architecture. The mass that one would traditionally expect to support this complex programme seems to have vanished. Think of the fly towers of the National Theatre expressed as blank blocks of concrete mass in the skyline, or of the Festival Hall, where the auditorium hangs over the concourse like an egg in a box. Or think of Wembley, where the great arch loops into the sky as statement of how the building is engineered. There are none of these kinds of architectural expressions here. Even the huge HOK designed area is almost imperceptible. What you see instead is ephemera: a giant light sculpture, signage, screens, guitars on plinths, posters, palm trees, some stage-sett-ish scenography, and a lot of people. Even at 2am, there are people disembarking the Thames clipper heading into the O2. 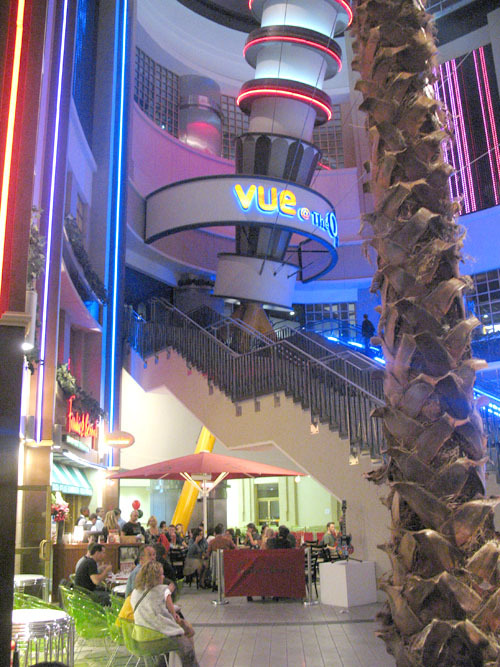 The O2 is UKs most complete example of an US style entertainment quarter. The explicit ambition is to pull entertainment activities that one might associate with metropolitan life and plug them into the core of the arena. It’s scale and ambition is different to anything we’ve seen before and is matched by shock-and-awe opening programme: 21 nights of Prince, Barbara Streisand, The Rolling Stones, Bill Clinton, the Simpson’s premier. Upcoming events include National Hockey League games (featuring AEG owned teams – an important detail, as I’ll explain soon), Basketball, The Tennis Masters Cup, Ultimate Fighting Championship, the White Stripes, Festival of Scouting, Tutankhamun & The Golden Age of the Pharaohs, and – most excitingly – Jeff Wayne’s Musical Version of The War of the Worlds. Later it will see 2009 World Gymnastics Championships and the 2012 Olympics artistic gymnastics and basketball events. The event calendar crystalises the diversity of contemporary entertainments and demonstrates the complexity of the venues requirements. You won’t understand this kind of building from examining its architecture. In this new kind of entertainment centre, the business plan is the generator. So, to get how the O2 works, you need to know how AEG works. AEG is a massive and broad company that also owns, amongst other things venues which include the Staples Centre and Home Depot Centre in LA. It is afiliated with Clarity Media Group (newspaper publishing), Walden Media and Bristol Bay Productions (film companies), Regal Entertainment Group (the largest motion picture exhibitor in the world), AEG Teleworks (broadcast center), Bounce (event marketing), Network LIVE (live digital entertainment provider). They also own various sport franchises in the US, Sweden, Germany and the UK. What you see here is a pattern of reciprocal companies who function is either content or distribution. The intertwined nature of AEG is illuminated by its web of related business interests. AEG developed the $150 million Home Depot Center which they continue to operate. You can think of this as the ‘distribution’. This is the home ground of the LA Galaxy who they also own and provide ‘content’ for the stadium. In an effort to improve the teams performance (and thus the value of the content) they signed media phenomenon and sometime footballer David Beckham. Beckhams media profile impacts on the recognition of the team, the venues ticket sales, the value of the stadiums naming rights, the demands of broadcasters, marketing opportunities and so on. The Home Depot is also home to the LA branch of the David Beckham Academy. The other site is here, in the shadow of the O2. This is business as feedback loop. It’s an entire ecosystem, which comes with its own morality – best seen in the policy of AEG movies which tell uplifting stories appropriate for audiences of all ages, rated G, PG and PG-13 only. Under these conditions, the idea of what architecture is transforms. The O2 isn’t a building; it is an apparatus – a mechanism for putting on multiple shows, events and experiences simultaneously and in rapid succession. 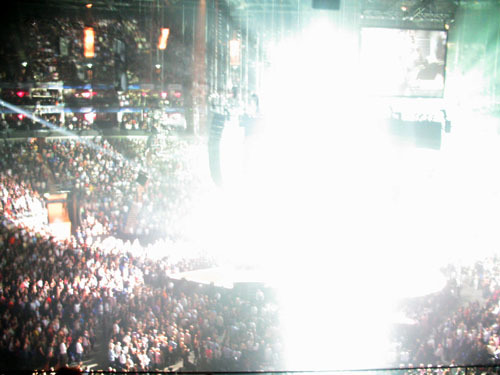 Technically, it can switch from Prince’s stage to the Rolling Stones then back within two days. It has on-site parking for 18 artics, reconfigurable for centre and end stage set-ups, for ice hockey (the stage base is a constantly maintained ice rink), basketball, and boxing. Attention to its performance is detailed: when the arena seats flip up, they have a padded underside making sound checks closer to the acoustic performance of a soft and fleshy audience. The arena is designed to generate ticket-value. It’s arranged in tiers- just like those other new venues (also designed by HOK Sport): Wembley and Emirates stadiums – where you can purchase your way through levels of service and comfort. The model was developed at AEGs Staples Centre in LA, where celebrity basketball fans sit courtside, and to enhance their experience are allowed to walk off court with the teams, and head into a ‘chairman’s room’ where they are joined by the players post-shower. Proximity to the experience is what’s on sale. Buildings like this aren’t objects but perpetual events. And everything becomes an event: Materials are sensations, lighting is an effect, circulation is theatre. Textures communicate ideas of quality and value. This surface mounted stuff is ephemeral, metaphorically (and often literally) glued together with low-tack adhesive. The visible realm of the building is often formed with graphics, lighting, screen based or projected media. It’s as though the surfaces are always provisional and might flicker into other guises at any moment – what you might call programmable space. The O2 is experienced as a succession of sensations rather than a totality, like a montage which segways between non-sequiturs. You can ride up escalators whose vertical drama has been escalated with a wash of ultra violet light. You glide past one of the Domes trademark yellow skylon-esque support towers whose engineering has been dragged up to look like a fruit skewered cocktail stick in a Pina Colada. Opposite a fake beach, a sci-fi blow-up branded chill out space sits surrounded by palm trees. A huge picture of Tutankhamuns death mask advertises the forthcoming exhibition, next to what looks like a piece of the Chrysler building flattened by a car-crusher. 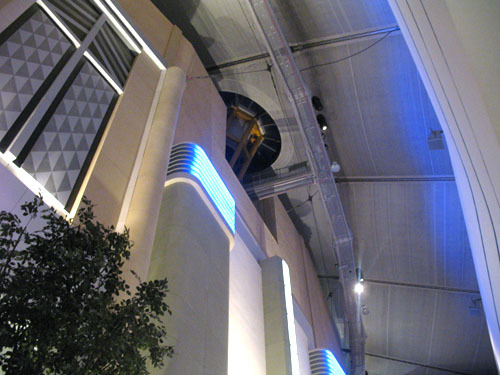 The IndigO2 is housed inside a piece of faux Miami Beach art deco that leads into the ‘architecture’ of the Entertainment Avenue. The language is – inexplicably – drawn from 1930s Americana. The fake facades wrap around the arena to form a doughnut of ‘street’ scene with bars and restaurants on ground and first floors, like a three-storey Broadway bent into a ring road. It’s the most solid part of the whole place but captures exactly the wrong aspects of cityscape. Instead of manufacturing a sense of authentic neighbourhood it recalls the useless dead weight of building. It’s not just the seemingly arbitrary retro-references, it’s also its real-ness – the bricks, the steel, the almost-authentic architectural detailing make it seem a step backwards. If you really want to be in a street you should never have left Soho, rather than a glowing hallucination of entertainment caught between hedonism and high security with your only route out of this isolated satellite a 30-minute boat ride along the tar-black Thames. At its best, the O2 uses the possibilities of sensation-addicted decoration with its own kind of truth to its lightweight materials. The integration of sponsorship is integral to its workings. O2 secured the naming rights in a ?? 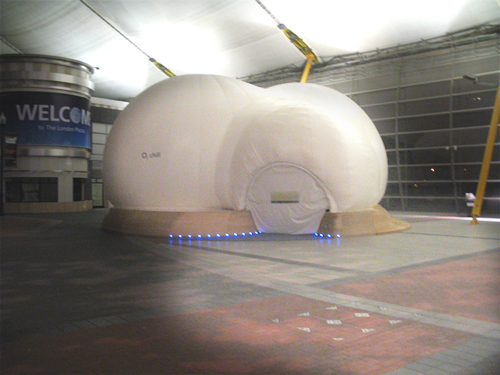 ?6 million-per-year deal, and along with that came opportunities to create O2 branded spaces – a stretch rubber cave with bubble tanks behind the bar, and bar for O2 customers who can text their way past an electronic door policy. Beyond this are more subliminal associations: the bubble light-sculpture in the grand foyer, the new front door in the shape of a giant O which swallows visitors. 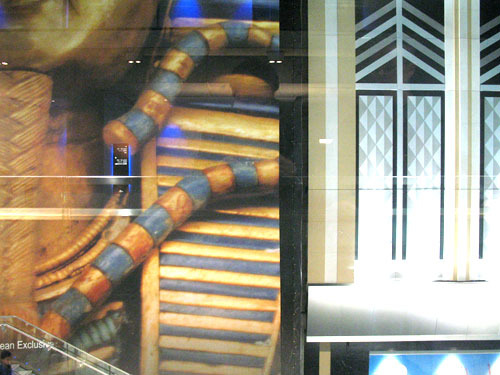 Remember, here all architecture is information: materials, colours, and graphics are fertile ground for brand synergy. All this serves to remind that the O2 is an explicitly corporate entity, so you have your fun on their terms. Outside the O2, Peninsular Square provides the link to North Greenwich Tube. Designed by Barr Gazetas, it has another take on the idea of programmable space. Colour changing lights are embedded into all kinds of surfaces, so even the solid granite ground becomes an animated surface. Water features and screens are linked to electronic controls that alter the scale and atmosphere of the square. Provisionalism here is more a function of a phased masterplan. Green walls formed with bolted together steel framed structure holding sedum panels form edges against plots awaiting development. Peninsular Square claims to be the biggest new public space since Leicester Square. It suggests that public space is merging with media. The O2 is not so much a landscape formed of distinct, articulated objects, more a haze of events, experienced in a motion blur of consumerism. It becomes a cascade of experience delivered with the just-in-time logistics originally developed by the military. Its dual architectural feats are to construct a hidden machine that manufactures endless entertainment opportunities and to make physical AEGs complex business model. Increasingly, large scale developers are aiming to extend their involvement beyond building to become operators, delivering content in all its forms: as car-clubs, telephony, advertising, finance, food supply and more. This scenario recasts architectural ideas of form and function as content and mechanism. This is a challenge to architects. It simultaneously erodes their traditional role and presents a joined-up world where everything becomes an architectural opportunity.